It’s been awhile since I posted. This is not to say I stopped cooking. There has in fact been a raging battle between myself and an army of cabbage that has stormed my kitchen over the last month or so. 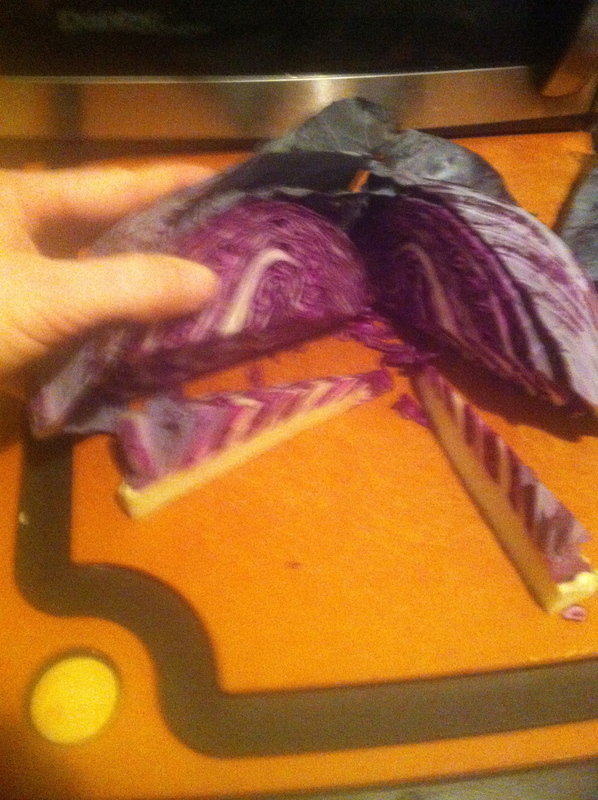 In my defense, they sent in the big guns first: a massive red cabbage with a small core and bad attitude. Team Cabbage, trying to break my spirit early on. I haven’t just gotten kale. I’ve gotten mustard greens, collard greens, several kinds of chard, dandelion greens (wow, was that a fiasco), red cabbage, green cabbage, boston red lettuce, loose leaf lettuce…okay let’s just say “many lettuces”. Lettuci. No I think the plural is probably lettuces. 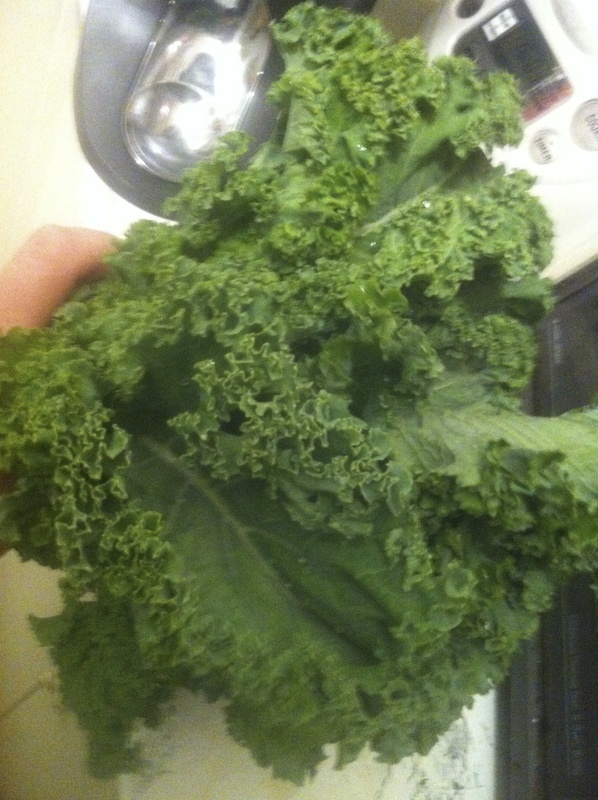 But the kale does keep popping up. And I am learning that it has as many varieties as any other fruit or vegetable, if not more. Here I thought there was just the one kind, namely, the pretty curly kind pictured below. Boy, was I wrong. It’s sort of like if you thought the only type of apple was a granny smith. Wrong, wrong, wrong. And the kind of variety you see in apples is actually a decent analogy for kale: big, small, soft, crisp, tart, bland, many many colors, you get the idea. But do you? I think you need to see it to understand. So before we get to the soup, here are most of the kinds I have encountered so far. I got four jalapenos in the Box of Wonders the other week. Jalapenos are generally not difficult to dispatch, but four was a little overwhelming. I put them up for grabs. Shae used one for a chicken-onion-tomato-bell pepper concoction that was quite tasty. I know because it made a lot so I volunteered to have some for dinner to help out. Chad used one for a Korean marinated steak dish called bulgogi that turned out great. I know because I stole some off of his plate when he went to get a drink. Stealing is bad, kids. Stay in school. So I had two peppers left, which seemed a bit more manageable. I could certainly have thrown them in a stir-fry, or even diced them on top of a salad, but I had recently noticed that the jerk ex-roommate who took the lid to my skillet with her when she moved out happened to leave a whole container of cornmeal behind. Not an even trade, mind you, but I’m not getting the lid back so I’ll go ahead and use the corn meal.